We just got back from a long and lovely trip (hence the lack of posts for the last two weeks). We were going to the east side of the state and stopped in one of my favorite places on the way. Hood River is nestled into the steep hills that crash down into the massive Columbia River; a frighteningly vast river that sweeps through the Columbia Gorge and out to the Pacific Ocean. Hood River fronts the water and then fans out away from it, up the hills and into the valleys between them as they ascend to the Cascade Mountains. We arrived early enough that the sun was still low in the East, and frost was kissing the tops of the hills. The air was clear, and Mount Hood, in all its stark, snowy beauty, stood out against a blue sky behind the town. We wound up into the hills along the Fruit Loop—a touristy road that takes visitors by a host of orchards, U-Pick operations, and cute farm stands—and stopped at one of our favorites, which sells cheap fruit at whole sale prices on Fridays. We left with some delicious Braeburn apples and a box of not-yet-ripe pears, not to mention some gift basket goodies they were overstocked with, including a bag of dried pears (the most delicious dried fruit there is) and a couple of gourmet brownies that were to die for. We spent the week relaxing. At least I did. Ryan built a fence (or most of one), but I mostly went on walks, visited the library, and spent many hours talking to my mother-in-law while she cooked and enjoying her delicious food. I ate far too many triple chocolate cookies. Oh dear. We visited dear friends on the way home, and I got some kitchen-organization inspiration (and ate some delicious wheat-berry salad), although we’ll see if I have the wherewithal to do anything about it. I’m thinking open cupboards. Any ideas? I’ve always assumed I could never keep them respectable enough (I love closing the doors on the mess), but the state of my cupboard doors is really despicable. And they can’t be painted (old plywood with some sort of vinyl stuck on). Well, my creative friend uses baskets to keep her clutter out of sight. I don’t know why I never thought of this before (although I’m not surprised that I didn’t), but this convinced me that maybe I could do the open cupboard look after all. Does anyone else have any suggestions/inspiration? It’s also hard to think about any major work in the kitchen because, while I’m doing it, I can’t cook. And that’s extremely difficult for me. 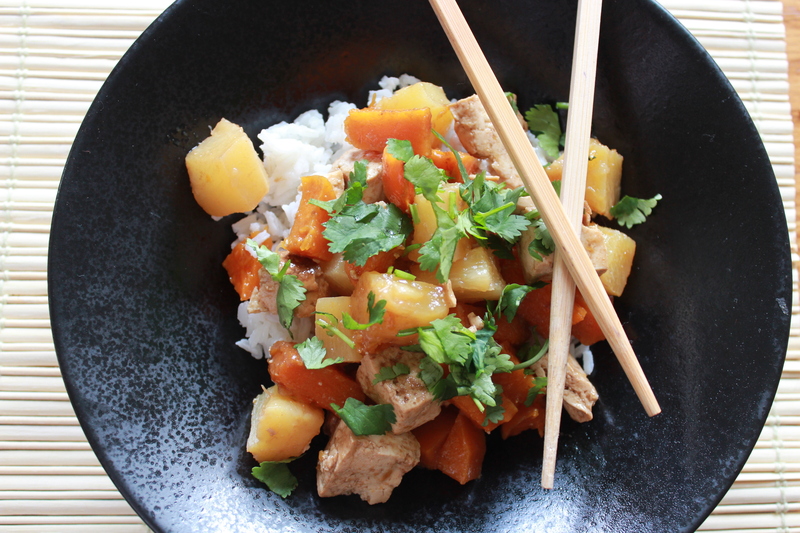 So while I ruminate over kitchen plans, I’ll be making this little number: a sweet medley of roasted butternut squash, tofu, and pineapple. I know it sounds like an odd combination but the flavors are great together. If you let it cook long enough, the butternut squash begins to char just a tad on the edges and the tofu gets firm and golden. 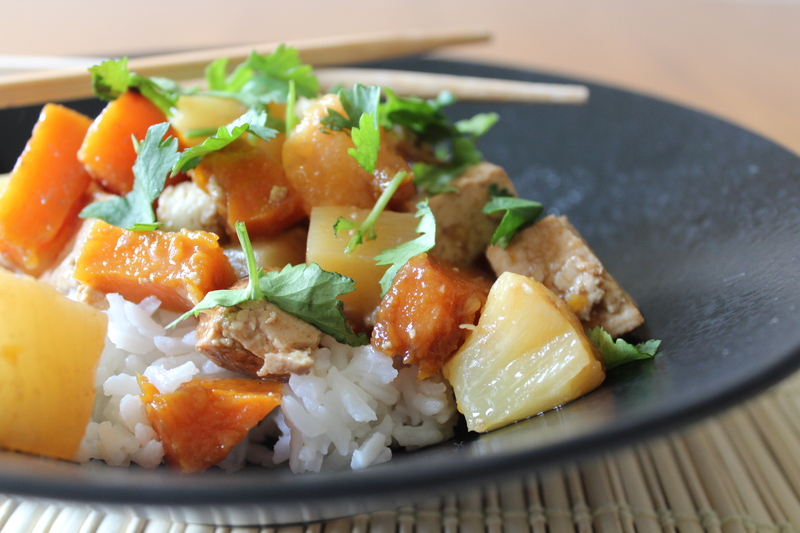 The pineapple adds a surprising pop of sweetness against the milder flavor of the squash, and the tofu takes on a delightful taste and firm texture. This is pretty fast, too, although you have to leave time for marinating, but the active work is minimal and can be done well in advance. It’s also a less conventional way to use up that pile of squash in my basement, which is slowly receding just in time for spring. I’m really into pineapple lately. I love pineapple upside down cake, although Ryan does not, and I can’t really justify making it anytime soon anyway, what with all those chocolate cookies (and the fact that Ryan has started making chocolate cake fairly regularly. Which I am not complaining about—it’s delicious—but it does leave less room on the dessert lineup). What is your favorite pineapple recipe? 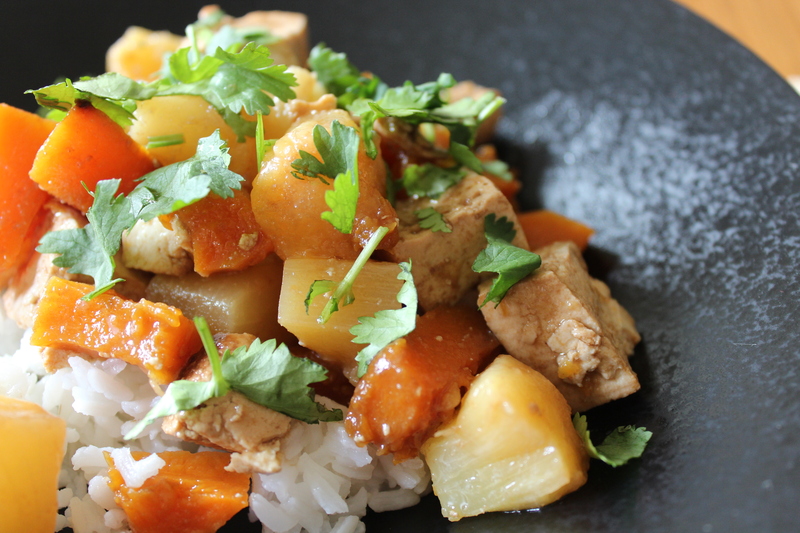 Vegetarian Meal with Meat Option: You could easily substitute all or some of the tofu with cut up chicken breasts. I would probably add the chicken after the squash had roasted for 20 minutes, though. If you leave it in the whole time, it will dry out. 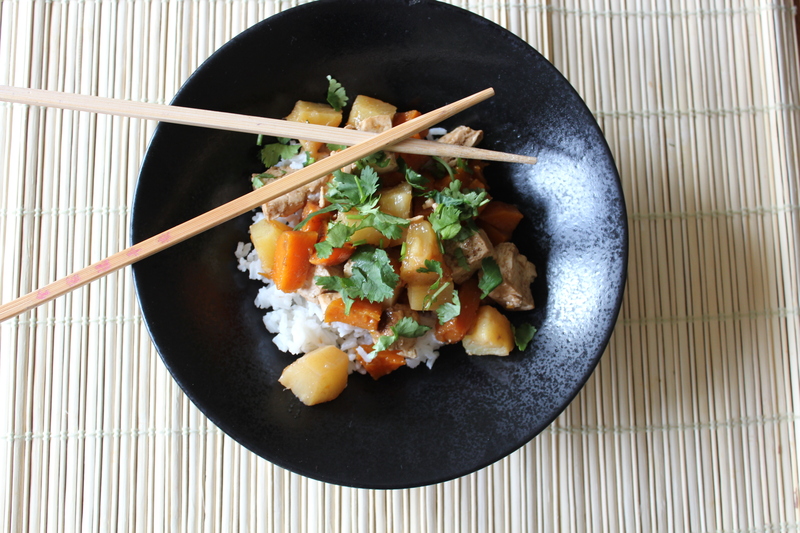 This Asian-inspired dish is unusual but delicious. 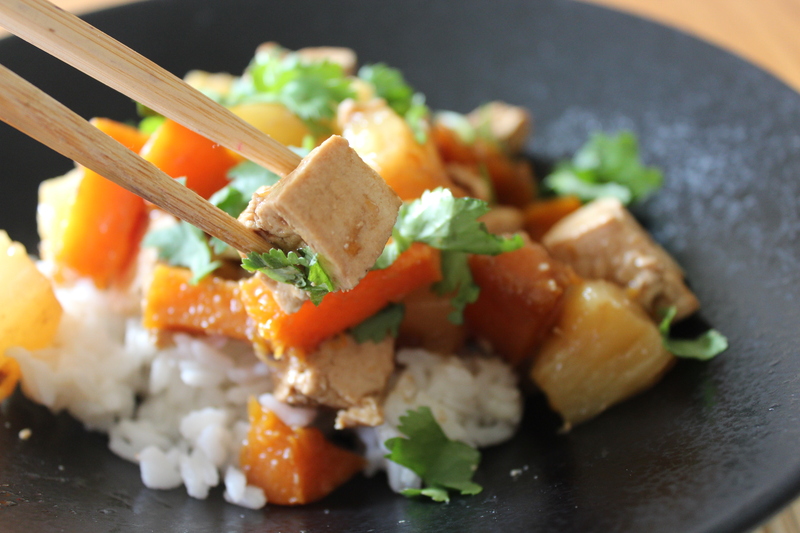 The butternut squash lends a mild flavor against the firm and substantial tofu and bright, sugary sweetness of the pineapple. Topping it with salted cashews and cilantro is a nice touch, but not required. Make sure you use extra firm tofu. I like to serve this with rice and an Asian-style cole slaw or green salad. It would also be nice with some steamed edamame. Remove the tofu from the package. Place it on a plate with another plate on top. Place a large can or other heavy object on the top plate. Let it sit (so the juices will drain) while you prepare the other ingredients, or for about 30 minutes. Drain it every once in awhile. Peel the butternut squash, and cut it into 1″ cubes. Drain the pineapple, reserving the juice, and set aside the fruit. Mix half of the juice with the soy sauce, balsamic vinegar, ginger, and olive oil. Pour half of this mixture into a 9×13″ glass pan. Cube the tofu into 1″ pieces. Place the tofu and squash in the pan and pour the rest of the marinade on top. Preheat the oven to 425 F. Place the pan in the oven and roast for 35 to 40 minutes, or until the squash edges are dark brown and the tofu is golden and firm and most of the marinade is evaporated or soaked up. Add the pineapple, pressing it down between the squash and tofu pieces so it touches the marinade in the bottom of the pan. Roast another 5 minutes until the pineapple is heated through. Remove from the oven. Serve with hot rice, sprinkled with cashews and cilantro if desired.